Today, more than ever, a woman needs to know what to look for on a first date; the things that would make it great, as well as the red flags she should be aware of, in order to be safe. With strangely coincidental timing, the trial of the disgraced CBC radio host, Jian Ghomeshi, accused of assaulting women he worked with and dated, begins on Monday, February 1, just in time for Valentine's Day. Dating is almost always a challenging activity; first dates that much more so. Two people meet, often for the first time, hoping that there might be a basis for connection. 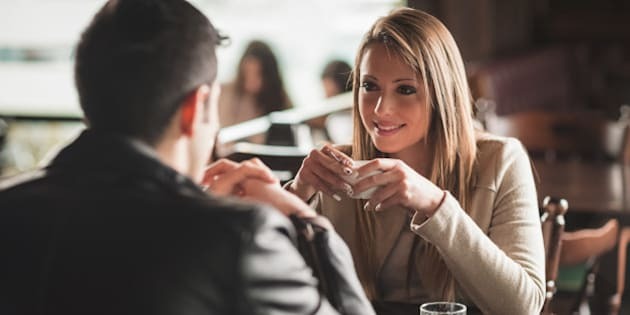 First dates can be awkward if it turns out that there's no chemistry, or if one person says or does anything to make the other person uncomfortable. Women who've recently ended a marriage or a long-term relationship are often dismayed to realize that if they want to find love again, they'll have to get back into dating. They'd thought that this not always pleasant part of social interaction was behind them forever. After years of not having to think at all about dating, a lot will have changed for women who are returning to the dating world. Stories like that of Mr. Ghomeshi are filling the airwaves, giving pause to women who are now contemplating the prospects of going on a first date. Seeing the news about the upcoming trial of Jian Ghomeshi, and thinking about the alleged assaults he committed while on dates, I wonder how many women are that much more nervous to be getting back on the dating scene. It must feel strange, knowing that there are men out there who look perfectly charming on the surface, but who could potentially attempt to assault them at the end of the date. How does a woman deal with such knowledge? In 2016, nothing is certain. Sadly, the world is rife with deeply wounded individuals, some of whom have the idea that wrapping up a date includes roughing up the other person. Today, women who've been off the market for a while and are just now getting back into dating need to be a lot more careful. They need to understand what they're getting into and who, exactly, they're going out with. Often, in this era of online connections, it's not easy to get a clear sense of the other person until the date is actually unfolding. During a date, a woman might find herself with a man who's making her feel uncomfortable, but out of politeness, or a common human tendency to minimize bad behaviour, she's unsure of what to do. A woman getting back into dating should be aware of how to maximize the possibilities of each first date and how to take the best possible care of herself during the date, so that she feels confident about going on a second date with this person, or trying a first date with someone else. Whatever happens with regard to Mr. Ghomeshi's case -- and I think that this depends on our justice system, more than anything -- people still have to date. Every relationship has a beginning, and much of the time it's in the form of a first date. Even though stories like Mr. Ghomeshi's might make the idea of resuming dating a bit scarier, I think that with the right knowledge and skills, any woman can get back on the market with confidence. Fortunately, there are a lot of terrific men out there, and if a woman knows what to look for, she can cut short the bad dates and focus on creating great dates with the right type of guy. With a clear understanding of what's OK on a first date, what's not OK, and how she can take good care of herself, any woman can get back on the dating market certain that whether terrible or great, her first dates will always be a learning experience and will always be safe.